Yesterday, the Boston Guitar Orchestra held its first open rehearsal at the Somerville Public Library. I dare take credit for suggesting it to Robert, the conductor and artistic director. 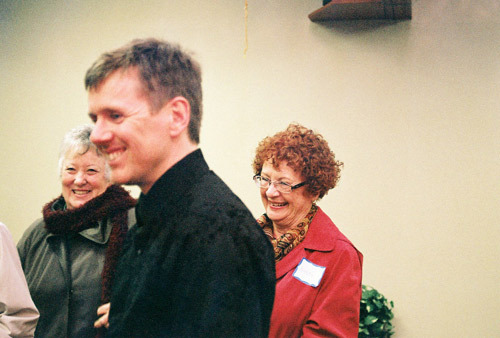 Rehearsing in a public space will draw attention to who we are. This idea was born years ago when I proposed to situate new digital pianos from my innovation grant in the library and other places outside the classroom. Visibility raises awareness. So what was it like to rehearse in the open? A creative complaint turns viral on today’s Internet, powered by search engines and fueled by eager readers hungry for sticky tunes and interesting stories. Springboarding from my previous post “United breaks guitars and guitar cases,” I am reminded of another creative complaint that I found years ago when populating my hotel reviews web page. On page 211 of the book “Buzzmarketing: get people to talk about your stuff,” the author Mark Hughes tells the story of two weary business travellers who made an ingenious power point presentation about their double troubles at the Double Tree Hotel in Houston. The incident occurred in November 2001. Just google “Doubletree powerpoint complaint” to find the file posted all over the Web. Such creative complaints become the stuff of legends. People start to wonder if the complaint was based on a true story. It was. Why would anyone go into such great lengths to create something clever out of something that caused pain, inconvenience, and suffering? If it’s creative, it will get attention. People like to share. There has never been a better time for sharing and connecting. Turn something loose on the Internet, a spark of creativity becomes viral. I wrote a parody on “Oh Christmas Tree” as a Christmas present to Mr Tannenbaum in 2000 when I did not get the services I paid for. That was before Google, WordPress, Twitter, and Facebook. Mr Harris Tannenbaum is still operating an immigration business in Atlanta, Georgia. Classical guitarists and their luthiers develop relationships that pianists almost never have with their piano builders. 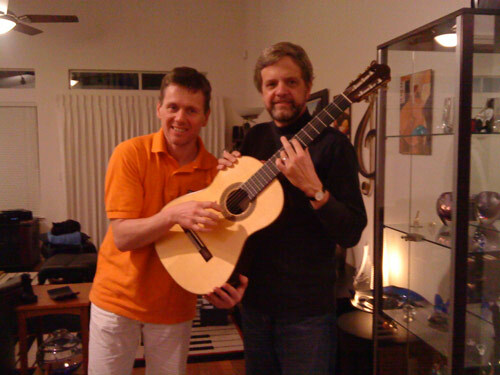 Dutch guitarist Robert Bekkers, who plays a Hihorst concert guitar from Amsterdam, meets American luthier John Decker in Maui and tries his handmade guitars. A luthier is someone who builds guitars, i.e. a guitar maker or guitar builder. A lute player is someone who plays lutes. Classical guitarists are very different from pianists in that they are more likely to know their instrument makers than not. I may be biased because of my duo partnership with a classical guitarist who is curious to try new guitars of luthiers he meets. The builder of his Hilhorst guitar makes only 6 guitars a year, two at a time. Each time he finishes a pair, he invites Robert Bekkers to visit him in his workshop in Amsterdam. Each time, Robert hopes that he has not built a better guitar than the one he bought in 2005, to be assured that he made a good investment. At the same time, he is honoured that he can try out the newborns before they get sent to their final destinations. Unlike pianos, guitars take less time to build. They are often the result of one person’s dedication —- handmade in a workshop and not manufactured in a factory. The ownership is clear: the luthier designs and creates his own unique product. He usually has a philosophy and approach to making his guitars. Robert’s Amsterdam-based luthier Jeroen Hilhorst, for instance, builds concert guitars, i.e. for the concert stage. Other luthiers follow the tradition that has passed down from father to son, keeping the shape, size, feel, and sound as close to the original concept of a guitar as possible. Recently I discovered the Guitar Master Works website of Maui-based luthier John Decker. 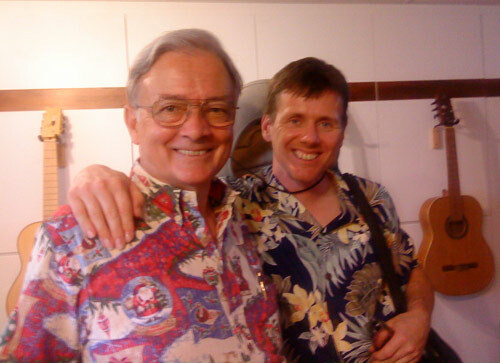 I had the pleasure of meeting him at a Rotary Club of Maui Thursday luncheon and quickly struck up a conversation about guitar building and book publishing. Dr John A. Decker, Jr was not born a guitar builder but became one after working in different fields. The story of how he decided to build guitars is a fascinating one. As a physicist, Dr Decker addressed the challenges of building a guitar that could last in humid, tropical climates. Many characteristics of the guitar are results of compromises: weight vs the thickness of the soundboard, stiffness of the neck, kind of wood used, etc. As an entrepreneur, Decker experimented with different designs and construction. The guitars on display in his office were all different, as Robert found out in the ensuing hour. From Facebook to Sacramento Guitar Society — a tale of guitarists with one thing in common: a burning passion for the classical guitar. 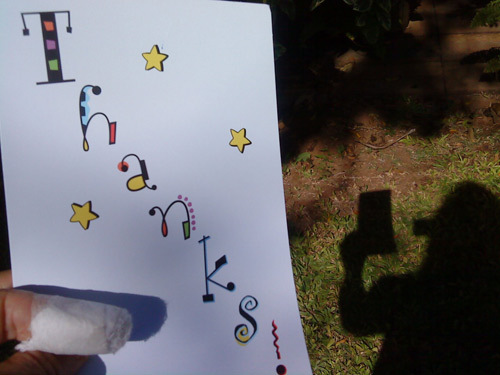 Today we received a thank you card signed by members of the Sacramento Guitar Society. The card brought back fond memories of the last day of our concertising in mainland USA this year. With my left index finger bandaged after 3 stitches (above), I decided it was time to use it to type a long overdue blog post about our last day of performances. How one thing leads to another is the story of our concert tour. Over a year ago, our friends Rachel and Jeff invited us to their new home in Davis, CA. They had spent a year in Utrecht, Netherlands using it as a base to travel throughout Europe whenever they could. We, of course, wanted to visit them but could not imagine flying to California just for a long weekend. One day, I spotted someone on Robert Bekkers’ Facebook with “Sacramento, CA.” I “friended” John Oster and wrote that we wanted to go to California for we had friends in Davis. He replied and suggested that we contact Daniel Roest, president of the Sacramento Guitar Society. That’s how it began. 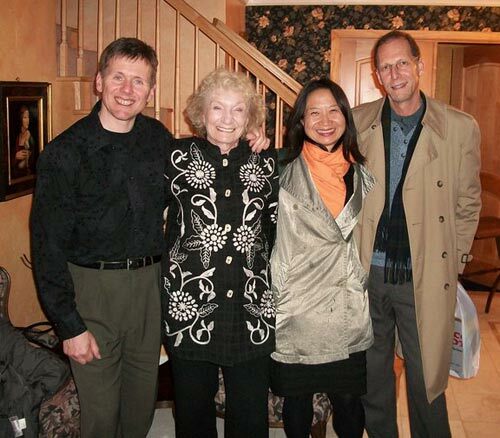 I introduced our duo to Daniel Roest who replied that another piano guitar duo had visited them before. He invited Robert Bekkers to play a few solo pieces at their next guitar society meeting on Sunday 21st November 2010. Little did I know that our e-mail correspondence would lead to the Sacramento Guitar Society to mobilise themselves to find a venue with a piano so that we could play as well. This resulted in a house concert in the elegant home of Mary Wesley in Carmichael, just outside Sacramento, on the evening of the 21st. Less than 24 hours before the last house concert, we were performing in the loft apartment of two pianists in San Francisco. It was a brilliant ending of a 5-week, 8-state concert tour with many stories to share. When pianists get together, we try to play duets. When guitarists get together, they try each others guitars. We have still to meet another piano guitar duo. Will it be 4 hands on one piano with two guitars? Below: Robert and John at the end of their guitar evening in Davis, CA.